IgA are major effectors of antimicrobial defense in the respiratory and digestive tracts. We have analyzed the requirements for and the modalities of switching to IgA using our recently identified monoclonal model of human germinal center differentiation, CL-01 B cells. CL-01 cells bear surface IgM (sIgM) and sIgD and switch to all seven downstream isotypes in response to physiologic stimuli. In these cells, CD40 engagement by CD40 ligand induces production of endogenous TGF-β and IL-10, expression of germline Iα1-Cα1 and Iα2-Cα2 transcripts, mature VHDJH-Cα1 and VHDJH-Cα2 transcripts, and IgA secretion. 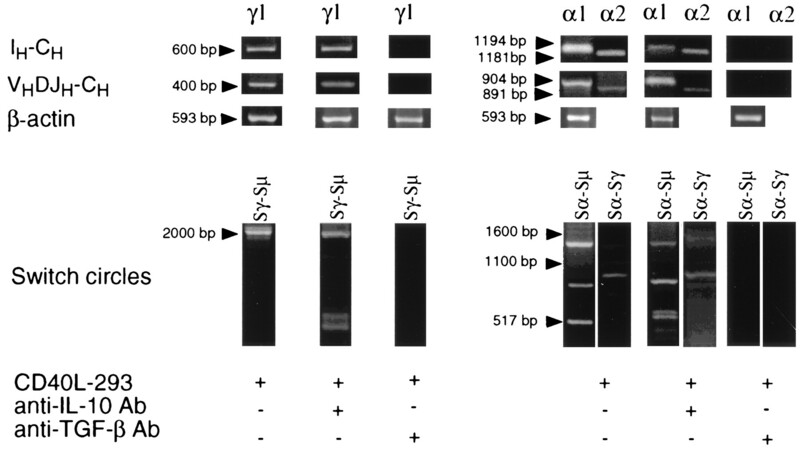 These events are associated with not only direct Sμ→Sα, but also sequential Sμ→Sγ, Sγ→Sα DNA recombination, and are ablated by neutralizing anti-TGF-β but not IL-10 Ab, and indicating that TGF-β, not IL-10, is a crucial mediator of the transcriptional activation and recombination of human Cα1 and Cα2 genes. Our findings in CL-01 cells were reproduced in freshly isolated naive sIgM+ sIgD+ B lymphocytes. Thus, engagement of CD40, in the absence of other (known) stimuli, is sufficient to effectively induce switching to IgA in human B cells. This is effected by direct and sequential DNA recombination events, which are both dependent upon endogenous TGF-β secreted by the CD40L-induced B cells. Class switching to IgA represents a crucial effector component of the immune response at the host environment interface. Switching of IgM+ IgD+ precursors to IgA+ B cells in the germinal centers (GCs3) of the lymph nodes, spleen, and respiratory and intestinal tract-associated lymphoid tissue gives rise to Abs that are readily transported across the respiratory and intestinal mucosae, and are endowed with effector properties that are critical for the local humoral immune response. IgA secreted into breast milk passively immunize the neonate against microbial pathogens in early life. Specific IgA effectively hamper the entrance of bacteria and viruses through the respiratory and intestinal mucosae throughout life, and patients with IgA deficiency are affected by repeated upper respiratory tract and/or gastrointestinal infections. Mainly because of the lack of an optimal in vitro B cell model, previous studies have provided valuable but incomplete information on the requirements for and the modalities of class switching to IgA. In the mouse, Sμ→Sα DNA recombination is preceded by the expression of germline Cα transcripts (Iα-Cα transcripts), consisting of mRNA that reflects the sequence of the Iα exon, located upstream of the corresponding Sα region, and that of the Cα exons (1, 2). It occurs through looping out and excision of the intervening chromosomal DNA, which is released as an extrachromosomal reciprocal recombination product or “switch circle” (2), and brings a given rearranged VHDJH gene segment in proximity of the targeted downstream CH gene. The transcriptional activation of Cα genes has been suggested to be induced by TGF-β, but the induction of Sμ→Sα DNA recombination is thought to require additional signals, such as those provided by LPS or IL-2 (3, 4). In addition, high rates of IgA secretion have been effectively induced in murine resting B cells by surface IgD (sIgD) crosslinking and concomitant exposure to either LPS or CD40 ligand (CD40L, CD154), TGF-β, IL-4, and IL-5 (5), indicating that efficient induction of switching to IgA may require multiple inducing stimuli. Studies in human B cells have suggested that TGF-β triggers both Iα1-Cα1 and Iα2-Cα2 germline transcription (6) but induces VHDJH-Cα1 and VHDJH-Cα2 mature transcription only in the presence of additional costimulatory signals, such as those provided by Branhamella catarrhalis (7), Staphylococcus aureus Cowan I, or CD40 engagement (8, 9, 10, 11). IL-10 has also been implicated as playing a critical role in the events leading to VHDJH-Cα mature transcription and IgA synthesis (8, 10, 12, 13), but definitive proof that IL-10 directs Sμ→Sα DNA recombination has not been provided. Because of the heterogeneity of the human B cell fractions used in many studies (10, 14), a thorough discrimination between switching to IgA and replication and differentiation of IgA+ B cell precursors has not always been possible, thereby hampering a definition of the relative contribution of IL-10 and TGF-β to the induction of Cα1 and Cα2 transcriptional activation, and VHDJH-Cα1 and VHDJH-Cα2 mature transcription. The suggestion that B cells can produce TGF-β and IL-10 (15, 16) adds further complexity to the definition of the precise role of these endogenous cytokines in switching to IgA. Finally, still awaiting a definition are the relative contribution of sequential Sμ→Sγ, Sγ→Sα (if any) DNA recombination to the generation of mature VHDJH-Cα1 and VHDJH-Cα2 transcripts, and the minimal requirements for induction of DNA recombination to Cγ, as an intermediate step in such a putative sequential switching to Cα1 or Cα2. In this study, we have used our recently identified human monoclonal model of GC differentiation, sIgM+ sIgD+ CL-01 cells (17, 18, 19), as well as freshly isolated naive B cells to define the requirements for and the transcriptional and recombinatorial modalities of switching to IgA. Our findings indicate that switching to IgA in the human is dependent upon CD40 engagement and induction of endogenous TGF-β and is associated with not only direct Sμ→Sα but also sequential Sμ→Sγ, Sγ→Sα DNA recombination. The human monoclonal CL-01 sIgM+ sIgD+ B cell line, a Burkitt’s lymphoma carrying the t(8; 14) translocation and spontaneously secreting IgM, has been described (17, 18, 19, 20). PBMCs were isolated from healthy subjects, depleted of T cells (17, 18, 21), tagged with a FITC-conjugated mouse mAb to human IgD (Southern Biotechnology Associates, Birmingham, AL), and then reacted with anti-FITCisomer 1 Microbeads (Miltenyi Biotec, Auburn, CA). The samples were kept on ice throughout these manipulations. Highly purified (naive) sIgD+ B cells were segregated using a MACS magnetic sorter (Miltenyi Biotec). The purity of these sIgD+ B cells was demonstrated by the lack of detectable VHDJH-Cγ and VHDJH-Cα transcripts using a nested RT-PCR with a VH FR3 sense primer and Cγ, Cα antisense primers as described later in this section (not shown). B cells were cultured in RPMI 1640 medium (Life Technologies, Grand Island, NY) supplemented with 10% heat-inactivated FCS, 2 mM l-glutamine, 100 U/ml penicillin, and 100 mg/ml streptomycin. For the Ig switching experiments, B cells were cultured at 0.5–1.0 × 104/well in 96-well plates at a 2:1 ratio with irradiated (4000 rad) human embryonic kidney 293 cells transfected with human CD8 or CD40L (CD8-293 cells and CD40L-293 cells, respectively) in a 200-μl volume. CD40L-293 cells express surface CD40L at threefold higher density than L cells transfected with CD40L (not shown). In some experiments, soluble trimeric human CD40L/leucine-zipper fusion protein (htCD40L) (Immunex, Seattle, WA) was used at 500 ng/ml instead of CD40L-293 cells. Human TGF-β1 (Genzyme, Cambridge, MA), and IL-10 (Schering-Plough, Kenilworth, NJ) were used at 0.5 ng/ml and 100 ng/ml, respectively. Neutralizing anti-TGF-β Ab and anti-IL-10 Ab (Genzyme) were used at the saturating concentration of 30 μg/ml. At this concentration, the anti-TGF-β Ab effectively neutralizes [3H]TdR uptake by mink lung epithelial CCL64 cells (see below), and the anti-IL-10 Ab abrogates IL-10-induced IgM and IgG secretion by human B cells (our unpublished results and 17 . Active TGF-β was measured in the culture fluids using a bioassay based upon [3H]TdR uptake by mink lung epithelial CCL64 cells (American Type Culture Collection, Manassas, VA) (22). Culture fluids were also tested for total human TGF-β and IL-10 content using specific ELISAs performed according to the manufacturer’s instructions (Biosource International, Camarillo, CA). Supernatants were assessed for IgA content using a specific ELISA (19). IgA1 and IgA2 were measured using ELISA based on specific anti-IgA1 and anti-IgA2 mAbs (23). B cells (105) were reacted for 30 min on ice with FITC- and phycoerytrin-conjugated Abs to human IgM (Sigma, St. Louis, MN) and IgA (Southern Biotechnology Associates) and then washed with PBS containing 3% BSA. Cells (104) were analyzed using FACScalibur (Becton Dickinson Immunocytometry Systems, Mountain View, CA), and the data were processed using the Macintosh CELLQuest software program (Becton Dickinson Immunocytometry Systems), which includes the Kolmogorov-Smirnov analysis tool (24). RNA was isolated from 3 × 106 CL-01 cells using the RNeasy Total RNA Kit (Qiagen, Cathsworth, CA) and then reverse transcribed using the SuperScript Preamplification System for first strand cDNA synthesis (Life Technologies). Germline Iα1-Cα1, Iα2-Cα2, and Iγ1-Cγ1, as well as mature VHDJH-Cα1, VHDJH-Cα2, VHDJH-Cγ1, and β-actin transcript cDNAs were PCR-amplified as described (19). Sα-Sμ, Sα-Sγ, and Sγ-Sμ switch circles were PCR-amplified from genomic DNA (500 ng) in a 50-μl volume containing 50 nM of each of the appropriate sense and antisense primers (19). To amplify Sα-Sμ switch circles, the Iα1/2 sense primer 5′ CAGCAGCCCTCTTGGCAGGCAGCCAG 3′ (spanning residues 843–868 of the consensus Iα sequence, GenBank Accession Number L04540) was used in combination with the 3′ Sμ antisense primer 5′ TGAGTGCCCTCACTACTTGCGTCCCG 3′ (Sμ region residues 4345–4373, X56795). To amplify Sα-Sγ switch circles, the Iα1/2 sense primer was used in association with the 3′ Sγ antisense primer 5′ CCTGCCTCCCAGTGTCCTGCATTACTTCTG 3′ (consensus 3′ Sγ sequence residues 3596–3625, U39737). The primers used for the amplification of Sγ-Sμ switch circles are reported elsewhere (25). The PCR conditions were: 10 min denaturation at 94°C, followed by 10 min annealing at 68°C (DNA polymerase was added at this step); then, 1 min denaturation at 94°C, 2 min annealing at 68°C, and 3 min extension at 72°C for 30 cycles. A second PCR was performed using the product of the first PCR as a template, together with the internal sense primer Iα1/2 5′ CTCAGCACTGCGGGCCCTCCA 3′ (consensus Iα sequence residue 918–938, L04540) in combination with the internal antisense primer 3′ Sμ 5′ CAGACTGTCATGGCTATCAGGGGTGGCGGGG 3′ (Sμ sequence residues 2981–3361, X56795), or 3′ Sγ 5′ CCCTGGAGTCCCACTGCAGGTG 3′ (Sγ sequence residues 3340–3361, U39737). 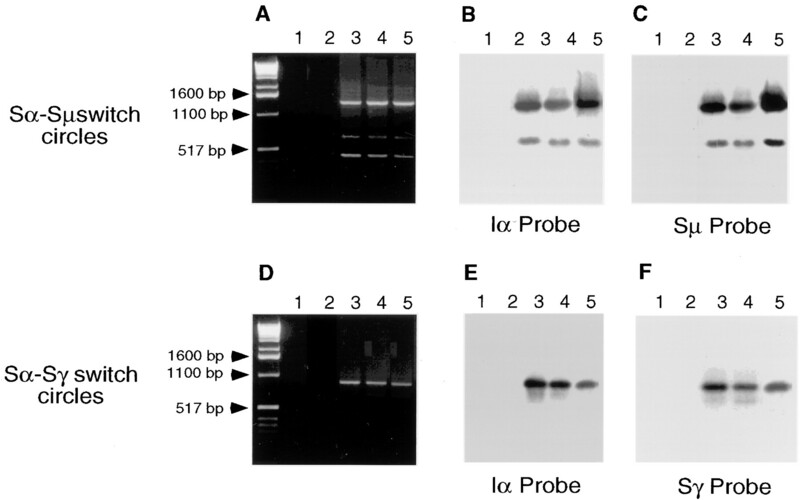 The DNAs PCR-amplified from switch circles were identified by Southern blotting using 5′ Iα, 5′ Sγ, 3′ Sγ, and 3′ Sμ region-specific probes generated by PCR amplification of artificial plasmid templates (19). Purified PCR-amplified switch circle DNAs were cloned using the TA cloning method (Invitrogen, Carlsbad, CA). Positive clones were PCR-identified using the 5′ Sα sense primer (Sα region residues 40–60) in combination with the above 3′ Sγ or 3′ Sμ antisense primers, and then sequenced by the dideoxynucleotide chain termination method using the TaqTrack DNA Sequencing System (Promega, Madison, WI). Each sequence was derived from the analysis of six independent recombinant clones. The DNA sequences were analyzed using the BLAST algorithm, as found in the National Center for Biotechnology Information web page, and the GenBank DNA sequence database. We addressed the requirements for switching to IgA using our monoclonal model of human GC differentiation, sIgM+ sIgD+ CL-01 cells. These B cells switch to all seven downstream Ig isotypes upon exposure to physiologic stimuli, i.e., CD40L and cytokines (19). CL-01 cells were cultured with CD40L-293 cells alone, CD40L-293 cells and TGF-β1, CD40L-293 cells and IL-10, CD40L-293 cells and both TGF-β1 and IL-10, or, as controls, CD8-293 cells alone, CD8-293 cells and TGF-β1, CD8-293 cells and IL-10, or CD8-293 cells and both TGF-β1 and IL-10. After 8 days, CL-01 cells were analyzed for sIgM and sIgA by fluorescence flow cytometry. 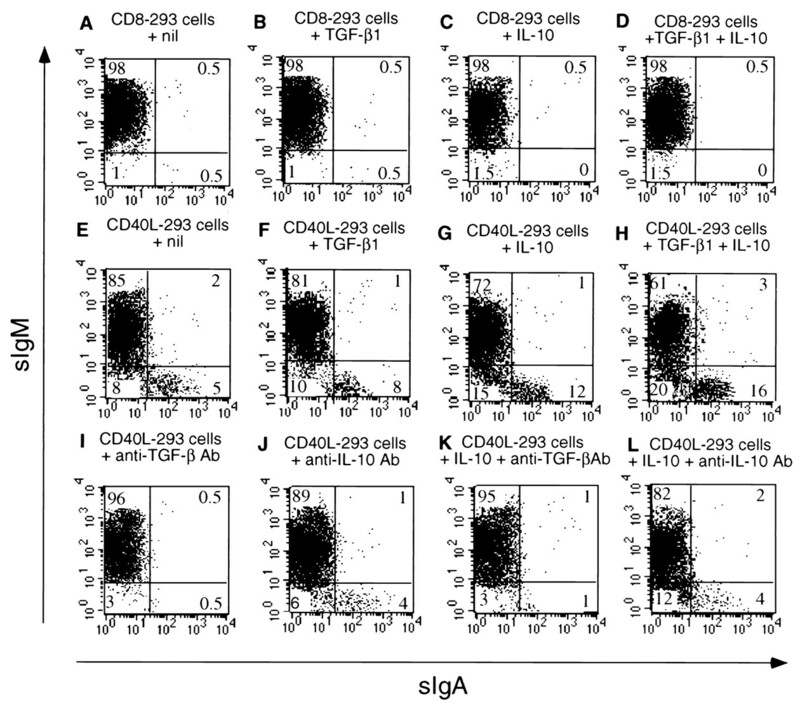 Virtually all CL-01 cells cultured with CD8-293 cells alone or with TGF-β1 and/or IL-10 lacked sIgA (Fig. 1⇓, A–D). In contrast, CL-01 cells cultured with CD40L-293 cells gave rise to sIgM+ sIgA+ and sIgM− sIgA+ cells (Fig. 1⇓E, cells in the right upper and lower quadrants equal about 2% and 5% of total cells, respectively). The proportion of sIgM− sIgA+ cells increased in the presence of (exogenous) TGF-β1 (∼8%) or IL-10 (∼12%) and was further boosted by both TGF-β1 and IL-10 (about 16%) (Fig. 1⇓, F–H). CD40 engagement induces human sIgM+ sIgA− B cells to switch to sIgM+ sIgA+ and sIgM− sIgA+ cells. sIgM+ sIgD+ CL-01 cells were cocultured with control CD8-293 cells alone, CD8-293 cells and TGF-β1 (0.5 ng/ml), CD8-293 cells and IL-10 (100 ng/ml), CD8-293 cells and TGF-β1 and IL-10; CD40L-293 cells alone, CD40L-293 cells and TGF-β1, CD40L-293 cells and IL-10, CD40L-293 cells and TGF-β1 and IL-10; CD40L-293 cells and anti-TGF-β Ab (30 μg/ml); CD40L-293 cells and anti-IL-10 Ab (30 μg/ml); CD40L-293 cells and IL-10 and anti-TGF-β Ab; or CD40L-293 cells and IL-10 and anti-IL-10 Ab (30 μg/ml). After 8 days, the B cells were analyzed by fluorescence flow cytometry for sIgM and sIgA expression. Numbers inside quadrants are percentages of the total cells. The results depicted are representative of three independent experiments. It has been suggested that activated human B cells express TGF-β mRNA (10, 15), but it is unknown whether this mRNA is translated into a secreted protein, particularly in the active form (26). To determine the contribution of endogenous TGF-β and IL-10 to the CD40L-induced generation of sIgA+ cells, CL-01 cells were cultured with CD40L-293 cells in the presence of a neutralizing Ab to either TGF-β or IL-10, and then analyzed for sIgM and sIgA expression. Switching to sIgA was virtually abrogated by the neutralization of endogenous TGF-β but not IL-10 (Fig. 1⇑, I and J). The virtual abrogation of IgA switching by anti-TGF-β but not anti-IL-10 Ab, even in the presence of excess IL-10 (200 ng/ml) (Fig. 1⇑, K and L), further indicated that TGF-β, not IL-10, mediated switching to IgA. To substantiate the indication by the above experiments that active TGF-β is secreted by CD40L-induced B cells, CL-01 cells were cultured with CD40L-293, soluble htCD40L, or control CD8-293 cells. After 2, 5, and 8 days, the culture fluids were analyzed for both total and active TGF-β and total IL-10, which has also been reported to be produced by activated B cells (16). Unstimulated CL-01 cells secreted some TGF-β and IL-10, but secretion of TGF-β and IL-10 was enhanced more than fourfold upon engagement of CD40 by CD40L-293 cells (Fig. 2⇓) or soluble htCD40L (not shown). A significant proportion of the secreted TGF-β was in the active form. CD40 engagement induces human B cells to secrete active TGF-β and IL-10. sIgM+ sIgD+ CL-01 cells were cultured in the presence of control CD8-293 cells (white bars) or CD40L-293 cells (gray bars), and total and active (hatched section of bar) TGF-β (A) and IL-10 (B) accumulated in the culture fluids were measured by a functional bioassay and a specific ELISA, respectively, after 2, 5, or 8 days. Values are mean ± SD of four determinations. These experiments show that in human sIgM+ sIgD+ B cells switching to sIgA+ is effectively induced by CD40 engagement and is mediated by the endogenous TGF-β, not IL-10, that is secreted in an active form by the CD40L-induced B cells. Recombination to a downstream CH gene is preceded by targeted IH-CH germline transcription and leads to the expression of VHDJH-CH mature transcripts, which are translated into functional Ig proteins (27). To investigate the role of CD40L and endogenous TGF-β in the transcriptional activation of human Cα1 and Cα2 genes, CL-01 cells were cultured in medium only, with control CD8-293 cells alone, CD8-293 cells and TGF-β1, CD40L-293 cells alone, CD40L-293 cells and TGF-β1, CD40L-293 cells and neutralizing anti-TGF-β Ab, soluble htCD40L alone, soluble htCD40L and TGF-β1, or soluble htCD40L and neutralizing anti-TGF-β1 Ab. Germline Iα-Cα and mature VHDJH-Cα transcript cDNAs were PCR amplified from cultured CL-01 cells after 2 and 5 days, respectively, and the amount of secreted IgA was measured in the culture fluids after 8 days. CL-01 cells cultured alone or with CD8-293 cells, in the presence or in the absence of TGF-β1, neither secreted detectable amounts of IgA nor expressed germline Iα-Cα or mature VHDJH-Cα transcripts (Fig. 3⇓A). Exposure of CL-01 cells to CD40L-293 cells or soluble htCD40L resulted in induction of germline Iα1-Cα1 and Iα2-Cα2 transcription, mature VHDJH-Cα1 and VHDJH-Cα2 transcription, and IgA (both IgA1 and IgA2) secretion (Fig. 3⇓A and not shown), which, consistent with the experiments of Fig. 1⇑, was enhanced by exogenous TGF-β1 and abrogated by the neutralization of endogenous TGF-β. CD40 engagement induces expression of germline Iα1-Cα1 and Iα2-Cα2 transcripts, mature VHDJH-Cα1 and VHDJH-Cα2 transcripts, and IgA production in human B cells. Histograms show the concentration (ng/ml) of IgA accumulated in the fluids of sIgM+ sIgD+ CL-01 cells (A) or freshly isolated sIgM+ sIgD+ naive B cells (B) cultured for 8 days with medium alone, CD8-293 cells alone, CD8-293 cells and TGF-β1 (0.5 ng/ml), CD40L-293 cells alone, CD40L-293 cells and TGF-β1, or CD40L-293 cells and anti-TGF-β Ab (30 μg/ml). Values are mean ± SD of four determinations from three independent experiments. Gels show bands derived from the fractionation of Iα1-Cα1 and Iα2-Cα2 germline transcript cDNAs and of VHDJH-Cα1 and VHDJH-Cα2 transcript cDNAs amplified from B cells harvested after 2 and 5 days, respectively, from the above cultures (1% agarose gel). The gels depicted here were obtained from one of three independent experiments yielding similar results. These findings were reproduced in freshly isolated human naive sIgM+ sIgD+ B cells (Fig. 3⇑B and not shown), further indicating that CD40 engagement, in the absence of other stimuli, effectively induces human B cells to initiate germline Iα-Cα and mature VHDJH-Cα transcription and IgA secretion. These events are crucially mediated by the endogenous TGF-β that is secreted by the CD40L-induced B cells. Switch recombination occurs between two different S regions, each located 5′ of the recombining CH genes. While switching to IgG or IgE in human B cells has been formally associated with S-S DNA recombination (25, 28), IgA has not been conclusively shown to be associated with a recombinatorial event. Rather, the consistent occurrence of circulating sIgM+ sIgA+ B cells has suggested the possibility that in humans IgA synthesis results from alternative RNA splicing rather than DNA recombination (29, 30). To analyze the role of S→S DNA recombination in switching to IgA, CL-01 cells were cultured in medium only, with CD8-293 cells and TGF-β1, or with CD40L-293 cells alone. After 5 days, genomic DNA was extracted from the cultured CL-01 cells, and the extrachromosomal Sα-Sμ and Sα-Sγ DNA switch circles were amplified using specific PCRs. No junctional Sα-Sμ or Sα-Sγ DNAs were amplified from CL-01 cells cultured with CD8-293 cells with or without TGF-β (Fig. 4⇓, A and D, lanes 1 and 2). In contrast, Sα-Sμ (∼0.45, 0.7, and 1.3 kb) and Sα-Sγ junctional cDNAs (∼0.9 kb) were consistently amplified from three independent cultures of CL-01 cells with CD40L-293 cells (Fig. 4⇓, A and D, lanes 2, 3, and 4). The extrachromosomal Sα-Sμ or Sα-Sγ switch circle origin of the PCR DNAs was verified by sequential hybridization with specific [α-32P]-Iα and -Sμ or -Sγ probes. The 0.7- and 1.3-kb, but not the 0.45-kb Sα-Sμ fragments hybridized with the Iα and Sμ probes (Fig. 5⇓, B and C), while the 0.9-kb Sα-Sγ product hybridized with the specific [α-32P]-Iα and -Sγ probes (Fig. 5⇓, E and F), indicating that both direct Sμ→Sα and sequential Sμ→Sγ, Sγ→Sα DNA recombination had occurred in the CD40L-induced B cells. CD40 engagement induces not only direct Sμ→Sα but also sequential Sμ→Sγ, Sγ→Sα DNA recombination in human B cells. Sα-Sμ (A) and Sα-Sγ (D) extrachromosomal reciprocal DNA recombination products (switch circles) were PCR amplified from genomic DNA of sIgM+ sIgD+ CL-01 cells cocultured for 5 days with control CD8-293 cells alone (lane 1), CD8-293 cells and TGF-β1 (0.5 ng/ml) (lane 2), or CD40L-293 cells alone (lanes 3, 4, and 5), and fractionated through a 1% agarose gel. The PCR-amplified DNAs were blotted and hybridized with [α-32P]-Iα (B and E) and -Sμ (C) or -Sγ (F) probes. Junctional sequences of the Sα-Sμ and Sα-Sγ DNA switch circles from the experiment of Fig. 4⇑. Sα-Sμ and Sα-Sγ Southern blot-positive PCR DNAs were cloned, and three clones from each DNA (indicated as A1, A2, A3; B1, B2, B3; and C1, C2, C3) were sequenced. Dashes indicate identities. Arrows indicate the breakpoint site within Sα, Sμ, or Sγ region (top and bottom sequences). The number of the breakpoint site corresponds to the residue number of the Sα, the Sμ, and the Sγ sequences as given in the EMBL/GenBank/DDBJ sequence database under accession number L04540, X56795, and U39737, respectively. The detection of only two Sα-Sμ and only one Sα-Sγ switch circles in our multiple experimental samples suggested that both direct and sequential switch DNA recombination occurred at the level of yet to be characterized “hotspots,” and perhaps reflects the monoclonality of our Ig switch model. To characterize these putative hotspots, and to define the subclass composition of the Sα-Sμ and Sα-Sγ switch circles, the PCR DNAs that hybridized in the above experiments were cloned, and three clones from each DNA were sequenced. The α and γ genes involved in the S-S DNA recombination were determined by careful analysis of key nucleotides within the Iα and Sγ regions. 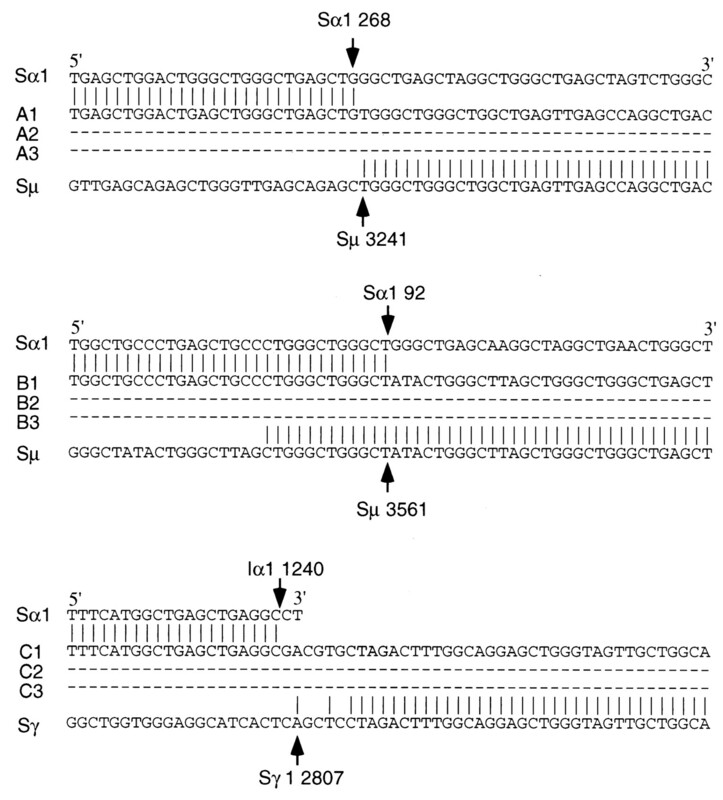 All three clones from each fragment were identical and consisted of a Sα1 region combined with a Sμ and Sγ1 region, respectively (Fig. 5⇑). In the Sα1-Sμ circles, the breakpoint was located within the Sα1 region, while, in the Sα1-Sγ circles it was at the 3′ end of the Iα1 sequence, suggesting that direct and sequential recombination to Cα1 involves different breakpoints. It has been suggested that IL-10 plays a role in directing switching to IgA (10, 13, 31), but such a role was not supported by our demonstrations that the neutralization of IL-10 does not affect switching to IgA, while that of TGF-β ablates the IL-10-dependent expansion of sIgA+ B cells (Fig. 1⇑, I–L). We analyzed the role of IL-10 in the transcriptional activation and recombination of the human Cα1 and Cα2 genes using CL-01 cells cultured with control CD8-293 cells alone, CD8-293 cells and IL-10, CD40L-293 cells alone, CD40L-293 cells and IL-10, CD40L-293 cells and anti-IL-10 Ab, CD40L-293 cells and both IL-10 and anti-IL-10 Ab, or CD40L-293 cells and both IL-10 and anti-TGF-β Ab. Germline Iα-Cα and mature VHDJH-Cα transcripts were PCR amplified from the CL-01 cells cultured for 2 and 5 days, respectively. Secreted IgA was measured in the culture fluids after 8 days. 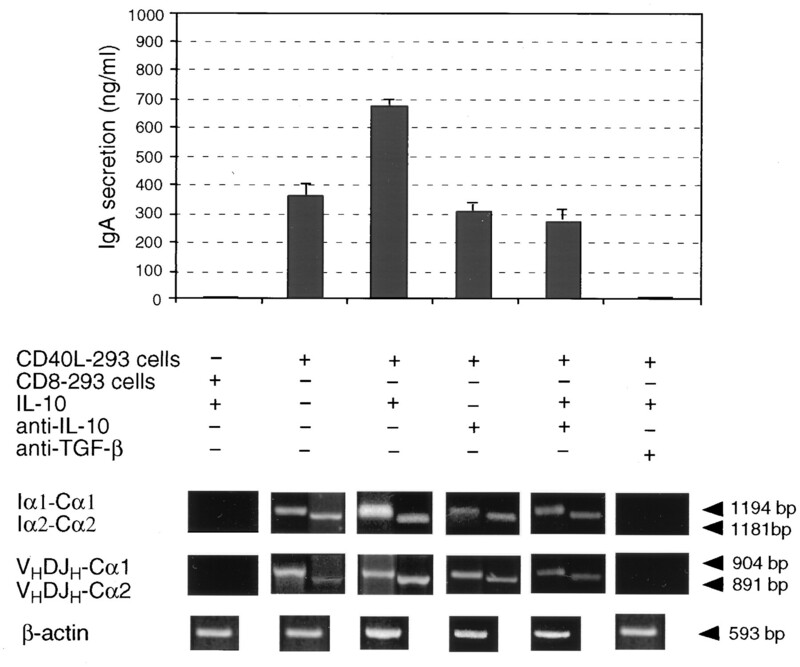 Upon incubation with CD8-293 cells alone (not shown), or with IL-10, CL-01 cells neither secreted IgA nor expressed germline or mature Cα transcripts (Fig. 6⇓). In contrast, and as expected from the findings of Fig. 1⇑, upon culture with CD40L-293 cells CL-01 cells secreted significant amounts of IgA and expressed germline Iα1-Cα1, Iα2-Cα2, and mature VHDJH-Cα1, VHDJH-Cα2 transcripts. Expression of Cα1 and Cα2 transcripts and IgA production were both boosted by exogenous IL-10 and were only marginally affected by neutralizing anti-IL-10 Ab, suggesting that endogenous IL-10 played only a minor role, if any, in the overall CD40-induced IgA production. The amount of anti-IL-10 Ab used far exceeded that required to neutralize the endogenous IL-10, as suggested by the original titration of this Ab (see Materials and Methods), and by the demonstration that an identical amount of the same Ab completely reversed the boost of IgA production induced by exogenous IL-10 but not residual IgA production (Fig. 6⇓). The ablation of IgA production by anti-TGF-β Ab in CL-01 cells cultured with CD40L-293 cells and supplemented with exogenous IL-10 further indicated that CD40-induced switching to IgA is dependent on endogenous TGF-β and not IL-10 (Fig. 6⇓). It also suggested that IL-10 is not directly involved in the transcriptional activation of Cα1 and Cα2 genes, which, rather, is strictly dependent on the presence of endogenous TGF-β. IL-10 enhances IgA secretion in human B cells induced by CD40L. Histograms show the concentration (ng/ml) of IgA accumulated in the fluid of CL-01 cells incubated for 8 days with CD8-293 cells and IL-10 (200 ng/ml), CD40L-293 cells alone, CD40L-293 cells and IL-10, CD40L-293 cells and anti-IL-10 Ab, CD40L-293 cells and both IL-10 and anti-IL-10, or CD40L-293 cells and both IL-10 and anti-TGF-β1 Ab. Values are mean ± SD of four determinations from three independent experiments. Gels show bands derived from the fractionation of germline Iα1-Cα1 and Iα2-Cα2 transcripts and from mature VHDJH-Cα1 and VHDJH-Cα2 transcript cDNAs amplified from CL-01 cells harvested from the above cultures after 2 and 5 days, respectively (1% agarose gel). The gels depicted here were obtained from one of three independent experiments yielding similar results. Having shown that switching to IgA can occur through direct Sμ→Sα or sequential Sμ→Sγ, Sγ→Sα DNA recombination, and because of the putative ability of IL-10 to mediate switching to IgG (12, 25, 27, 32), we addressed the issue as to whether endogenous IL-10 plays a role in mediating DNA recombination to Cγ, as a first step in the sequential Sμ→Sγ, Sγ→Sα DNA recombination. Germline Iγ1-Cγ1, Iα1-Cα1, and Iα2-Cα2 (after 2 days of culture) and mature VHDJH-Cγ1, VHDJH-Cα1, and VHDJH-Cα2 transcripts, as well as Sγ-Sμ, Sα-Sμ, and Sα-Sγ switch circles (after 5 days) were PCR-amplified in CL-01 cells that were cultured with CD40L-293 cells in the presence or in the absence of neutralizing anti-IL-10 or anti-TGF-β Ab. The concentration of secreted IgA and IgG was measured in the culture fluids after 8 days. We chose to analyze Iγ1-Cγ1 transcripts because of their putative involvement in sequential DNA recombination to Cα1, which is generally more frequently targeted than Cα2. The neutralization of endogenous IL-10 did not interfere with these DNA transcriptional and recombinatorial events (Fig. 7⇓) but abrogated the secretion of IgG (not shown). In contrast, the neutralization of endogenous TGF-β abrogated both germline Iγ1-Cγ1, Iα1-Cα1, Iα1-Cα1, and mature VHDJH-Cγ1, -Cα1, -Cα2 transcription, as well as the generation of Sγ-Sμ, Sα-Sμ, and Sα-Sγ switch circles (Fig. 7⇓), and IgG and IgA secretion (not shown), further confirming the TGF-β dependency of the transcriptional activation and recombination of the human Cα1 and Cα2 genes and demonstrating that endogenous TGF-β effectively mediates Sμ→Sγ1 DNA recombination as a first step in sequential recombination to Cα1. Endogenous TGF-β, but not IL-10, mediates both direct Sμ→Sα and sequential Sμ→Sγ, Sγ→Sα DNA recombination in CD40L-induced human B cells. Fractionation (1% agarose gel) of the germline Iγ1-Cγ1, VHDJH-Cγ1, Iα1-Cα1, Iα2-Cα2, and mature VHDJH-Cγ1, VHDJH-Cα1, and VHDJH-Cα2 transcript cDNAs, and Sγ-Sμ (∼2.0 kb), Sα-Sμ (∼1.5, 0.8, and 0.5 kb), and Sα-Sγ (∼1.5, and 0.9 kb) switch circle DNAs PCR amplified from CL-01 cells cultured for 2 and 5 days, respectively, in the presence of CD40L-293 cells alone, CD40L-293 cells and anti-IL-10 Ab, or CD40L-293 cells and anti-TGF-β Ab. The identity of these DNA products was verified as reported in the experiments of Figs. 4⇑ and 5⇑ (not shown). β-actin cDNA is shown as a control. We have used our monoclonal model of GC B cell differentiation, sIgM+ sIgD+ CL-01 cells, to address important aspects of switching to IgA in the human, including: 1) the definition of the minimal requirements for induction; 2) the secretion of endogenous TGF-β and IL-10 by B cells, and the contribution of these cytokines to the induction of the Cα1 and Cα2 gene transcription and recombination; and 3) the role of direct Sμ→Sα and, if any, sequential Sμ→Sγ, Sγ→Sα DNA recombination. We have ascertained the physiologic significance of our findings in freshly isolated circulating sIgM+ sIgD+ B cells. Previous in vitro experiments have suggested that a mitogenic stimulus, such as LPS or CD40L, does not trigger switching to IgA unless (exogenous) TGF-β is added to the B cell culture (3, 4, 5, 6, 7, 8, 25). Our findings confirm that TGF-β is required for switching to IgA, and show that the required TGF-β can be secreted by the CD40L-induced B cells. They demonstrate that in the absence of any other stimuli, CD40 engagement is sufficient to induce not only Iα1-Cα1 and Iα2-Cα2 germline transcripts, but also VHDJH-Cα1 and VHDJH-Cα2 mature transcripts, switch DNA recombination (as assessed by the detection of Sα-Sμ and Sα-Sγ switch circles) and surface and secreted IgA, and that this induction is strictly dependent on the CD40L-induced B cell-derived endogenous TGF-β. The less vigorous response and secretion of endogenous TGF-β by B cells challenged by the “less physiologic” agonistic anti-CD40 mAb or CD40L-transfected L cells, which express surface CD40L at a much lower density than CD40L-293 cells (see Materials and Methods), may explain the failure to induce IgA class switching in naive human B cells by other investigators (29, 31). The suggestion that CD40L and TGF-β do not induce IgA1 and IgA2 production in human naive B cells unless IL-10 is present (12, 14) and that this cytokine is crucial for the induction of mature VHDJH-Cα1 and VHDJH-Cα2 transcription (10) have suggested a crucial role for IL-10 in the molecular events that lead to IgA switching. Our experiments show that, like TGF-β, endogenous IL-10 is produced by CD40-activated human B cells, but its neutralization by specific Ab does not significantly affect germline and mature Cα transcription, nor does it affect the generation of Sα-derived switch circles, suggesting that this cytokine is not responsible for the induction of Cα1 or Cα2 gene transcription and switch DNA recombination. They also show that in CD40L-stimulated B cells, IL-10 significantly increases both the number of sIgA+ lymphocytes and the amount of secreted IgA. This biologic activity is specific in that it is reversed by neutralizing anti-IL-10 Ab. Thus, our findings indicate that IL-10 cannot substitute for TGF-β in the induction of IgA switching, rather it would boost proliferation and IgA secretion in already switched sIgA+ B cells. TGF-β is a ubiquitous pleiotropic cytokine that is secreted in a latent form and is activated by proteolytic cleavage (26). A major limitation in understanding how TGF-β induces switching to IgA is the scarcity of information on the source(s) of active TGF-β at the presumptive site of induction of Cα1 and Cα2 gene transcription, mainly the mucosa-associated lymphoid tissue, including the Peyer’s patches (26), and the regulation of the activation of the latent form of newly synthesized TGF-β1. Our findings indicate that B cells are a major source of TGF-β, which, upon CD40 activation, is activated and secreted in amounts sufficient to mediate effective class switching to IgA. The functional independence of CD40L-induced B cells from paracrine TGF-β may constitute an advantage at those sites, such as digestive and respiratory mucosae, where the prompt production of IgA effector molecules is crucial for an effective defense against viral and microbial pathogens. In addition, unlike paracrine TGF-β1, B cell-derived TGF-β1 may be secreted in amounts devoid of antiproliferative effects, which could hamper switching to IgA due to the functional linkage of the cell cycle with DNA recombination (26, 27). The induction of both Cα1 and Cα2 germline and mature transcription in monoclonal CL-01 cells suggests that a single B cell clonotype can undergo switching to Cα1 and/or Cα2 in response to the same IgA-inducing stimuli, i.e., CD40. This finding is consistent with the high homology of the human Cα1 and Cα2 gene upstream regulatory sequences, which contain overlapping PU-1/SP-1, cAMP-responsive element (CRE), and E box motifs (7, 37). These motifs have been shown in chloramphenicol acetyl transferase (CAT) assays to mediate either basal or TGF-β/phorbol ester-induced activity (7, 37). The lack of Sα2 regions in the switch circles analyzed here possibly reflect the relative scarcity of switching to Cα2 compared with Cα1 in human B cells. The DNA breakpoint was consistently different in the switch circles generated from direct and sequential DNA recombination to Cα1. In the Sα1-Sμ circles, this breakpoint was located within the Sα1 region, consistently proximal to a 5′ TGAG 3′ motif, which has been reported to be associated with S region recombination sites (38). In the Sα1-Sγ1 switch circles, the breakpoint was at the 3′ end of the Iα1 sequence, indicating a possible involvement of Iα1 in DNA recombination, perhaps owing to the presence of a χ-like recombination hotspot element within the Iα1 proximal promoter region (39). Interestingly, the junctional sequences of the Sα1-Sμ and Sα1-Sγ1 switch circles obtained from B cells induced by CD40L were similar to those of the respective circles from B cells induced by CD40L and IL-4 or IL-10 (not shown, see 19 . Thus, switch Sα recombination can occur within either the Sα or the Iα region, and Sα-Sμ and Sα-Sγ DNA recombination junctions can be conserved even if induced by different stimuli. Our demonstration that CD40 engagement alone is sufficient to effectively trigger Cα1 and Cα2 gene transcriptional activation and targeted Sα1 and Sα2 DNA recombination allows us to speculate that switching to IgA can take place in districts in which B cell CD40 is engaged by CD40L borne on cells other than T lymphocytes, such as mast-cells, endothelial cells, or dendritic cells (40, 41, 42), in the lamina propria mucosae of the respiratory and digestive tracts. At these sites, the TGF-β necessary to trigger switching to IgA, as well as to IgG, can be provided by the CD40L-activated B cells. Endogenous TGF-β could mediate both direct Sμ→ Sα and sequential Sμ→Sγ, Sγ→Sα switch DNA recombination. IL-10, which is also produced by CD40L-activated B cells, may further enhance the TGF-β-mediated IgA and IgG switching, not only by enhancing the replication and secretion of already switched B cells, but also amplifying the effects of both endogenously present and/or exogenously added TGF-β through either a synergistic and/or additive effect, or, possibly, by indirectly or directly influencing TGF-β levels in culture. Collectively, our findings define CD40 engagement and B cell-derived TGF-β as the two key factors in directing both direct Sμ→Sα and sequential Sμ→Sγ, Sγ→Sα switch recombination in human B cells, but provide no clue to the intracellular signaling pathways emanating from CD40 and TGF-βR and mediating the transcriptional activation of the Cα and Cγ genes. The definition of these pathways and that of the elements capable of binding to the evolutionary conserved regulatory regions upstream of these Ig H chain C genes are presently pursued in our laboratory through transfection experiments involving selected human Ig H chain locus DNA elements and human CL-01 cells. We thank Dr. E. E. Max (Center for Biologic Evaluation and Research, Food and Drug Administration, Bethesda, MD) for providing us with artificial Sγ-Sμ, Sα-Sμ, and Sα-Sγ construct; Dr. S. Lederman (College of Physicians and Surgeons, Columbia University, New York, NY) for providing us with CD8- and CD40L-293 cells; Dr. S. Narula (Schering-Plough Research Institute, Kenilworth, NJ) for providing us with human rIL-4 and human rIL-10; Dr. R. Goodwin and Ms. K. S. Picha (Immunex, Seattle, WA) for their gift of soluble trimeric human CD40L/leucine-zipper fusion protein; and Dr. T. A. McCaffrey for helping us with the measurements of TGF-β. ↵1 This work was supported by United States Public Service Grant AR 40908. ↵2 Address correspondence and reprint request to Dr. Paolo Casali, Division of Molecular Immunology, Department of Pathology, Cornell University Medical College, 1300 York Avenue, New York, NY 10021. 3 Abbreviations used in this paper: GC, germinal center; CD40L, CD40 ligand; CD40L-293, human CD40L-transfected human embryonic kidney 293 cells; CH, C region of the Ig H chain; FR3, framework 3; htCD40L, trimeric human CD40L/leucine-zipper fusion protein; I, intervening region; IH-CH, germline Ig transcripts; S, switch region; sIg, surface Ig; VHDJH-CH, productive Ig transcripts. ↵4 A. Schaffer, A. Cerutti, H. Zan, and P. Casali. Submitted for publication. Cerutti, A., A. Schaffer, S. Shah, H. Zan, and P. Casali. 1998. A monoclonal model of terminal B cell differentiation. Human IgM+ IgD+CL-01 cells secrete endogenous IL-6 and undergo IL-6-dependent plasmacytoid differentiation upon stimulation with CD40L and IL-10. In Molecular and Genetic Approaches to Disease: Immunology, Hematology and Oncology. Y. Niho, ed. Kyushu University Press, Fukuoka, Japan. Vol. 2.